InkZone PPI preset data reading into the CP2000 press console. Digital Information and CMYK Distributors at Print 18, McCormick Place South, Chicago, IL/USA, September 30 to October 2nd, 2018, Booth #315. With more than 4000 offset press connections worldwide of InkZone, their internationally renown, JDF-based preset and closed-loop color control system, Digital Information will be unveiling improvements to InkZone and the DJet at Print 18. Set for release at Print 2018 in Chicago, InkZone PPI is an exciting new component of the InkZone Ink preset and closed loop technology suite of solutions. 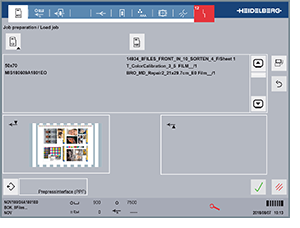 InkZone PPI is designed to replace Heidelberg’s outdated Prepress Interface. With InkZone PPI, commercial printers and packaging companies running legacy Heidelberg presses will be able to achieve perfect online ink key presets. InkZone PPI is compatible with the Windows 7/8/10 operating systems. It connects online to Heidelberg presses via the CP2000 console, which is installed on thousands of older sheetfed offset presses. A cost-effective and elegant solution for renewing the productivity of an older press, InkZone PPI is fully compliant with Heidelberg Color Assistant, as well as InkZone’s proprietary ink key calibration tools. InkZone PPI is an intuitive online ink key preset upgrade path for any Heidelberg press equipped with the CP2000 console. Visualization of optimized TVI by the InkZone TVI software package. Globally, there are thousands of offset presses equipped with spectral scanning devices. These devices have the capacity to change the way commercial printing and packaging companies capture data but are grossly underutilized. At Print 2018, Digital Information is pleased to introduce InkZone TVI. 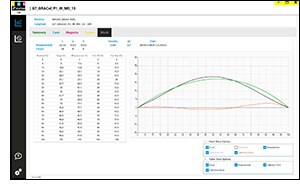 InkZone TVI enables users to automatically generate perfect plate curves for prepress workflows. InkZone TVI is a fully automated solution that collects and synthesizes color data across several print runs. The solution then creates a database from which InkZone TVI generates CTP curves and calculates the optimal compensation curve. This compensation data is saved in various formats compatible for import into most prepress workflows. InkZone TVI supports any paper type and target. It is a progressive solution for increasing the functionality and investment value of high-quality color scanning devices. The DJet, featuring the latest printers from Epson, will also be demonstrated in Booth #315 at Print 2018. The DJet is an innovative double-sided printing system capable of printing up to 40 double-sided 8-up forms per hour with a maximum print width of 43 inches (1076 millimeters). The system operates from roll to cut sheet and is suitable for imposition proof printing and small print runs in paper formats up to B0. Visit Digital Information and CMYK Distributors at Print 2018, Chicago/USA, September 30th to October 2nd, Booth #315. ® = CP2000 Center and Speedmaster are registered trademarks of the «Heidelberger Druckmaschinen AG» company. There are no organizational or commercial links with the «Heidelberger Druckmaschinen AG» company.